The Dens Park side threw away an early lead to lose 2-1 and fall behind the Paisley side with seven games to go. McIntyre called his side's defending for the winner "ridiculous" and said they must "stand up and be counted". "I'm gutted we lost, but we deservedly lost," the manager told BBC Scotland. "Once they scored in the second half, St Mirren were the better side. They were the ones that were biting and scratching and wanted it more. "Our reaction was poor. That's what happens at this stage of the season, nerves kick in, but we've got to be better in those key situations. But it's not done. We'll pick ourselves up and go again." Dundee led in the opening minute through Ethan Robson's first goal for the club, but Brad Lyons opened his St Mirren account when he headed in after Danny Mullen had levelled. As well as moving the Paisley side two points clear of the bottom of the table, the win moves them to within four points of Hamilton Academical, with the two meeting next Saturday. 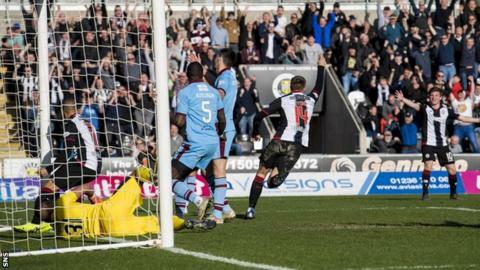 "We all crave that momentum and that springboard to kick forward," said St Mirren manager Oran Kearney. "The three points today will hopefully give us that. "We wasted the first half, but the way we got ourselves back into the game was brilliant. There were some huge performances. There's no wild celebrations. It's more of a tired changing room than an ecstatic one."